Are you visiting Athens (Greece) this summer? Here I am going to write ideas and tips about things you can do and places worth visiting, if you are going to be in Athens during the summer months. I am not going to write about the classic sightseeing and touristy stuff to do, as I’m sure you can find these in so many other sources. I love going out in Athens in summer! There are all kinds of events going on for all tastes. Festivals, concerts, theatre, bars, restaurants, cafes and much more. One of my favourite things to do is to go to open air cinemas, or ‘summer cinemas’ as we call them. If you like going to the cinema you should definitely go to the Athens Open Air Film Festival, which runs from June till August, showing new and old movies in various locations. The one I really want to see this summer is the Fight Club on July 25th. And it’s not because I haven’t seen the film, but because I want to watch a movie in that location, the Lycabettus Theatre in Lycabettus Hill. Lycabettus is a hill in the centre of Athens, from which you can have a 360° view of the whole city, as well as the Acropolis. I’ve seen pictures of previous movie showings there and it seems like a very unique experience. I also think Fight Club is an amazing movie, worth watching again and again. The Lycabettus Hill is also worth visiting, with or without the cinema. You can take amazing panoramic pictures of Athens and you can even see the sea from up there! Better to go in the early evening to enjoy the sunset and avoid the heat while going up. There is also a cafe and restaurant on the top and a little picturesque church. You can go by your own vehicle, cable car or walk there. There is a steep uphill to go up, obviously. 🙂 Have you ever been up there? Let me know in the comments! So, there are already three things I love in this article; open air cinema, the Fight Club and the Lycabettus Hill! Can it get any better? Athens has many amazing rooftop bars, as they have been springing up like mushrooms in the last few years. I remember there were maybe 3 or 4 when I left Greece 5 years ago, and every year I came back for the summer I used to see 1 or 2 new ones. 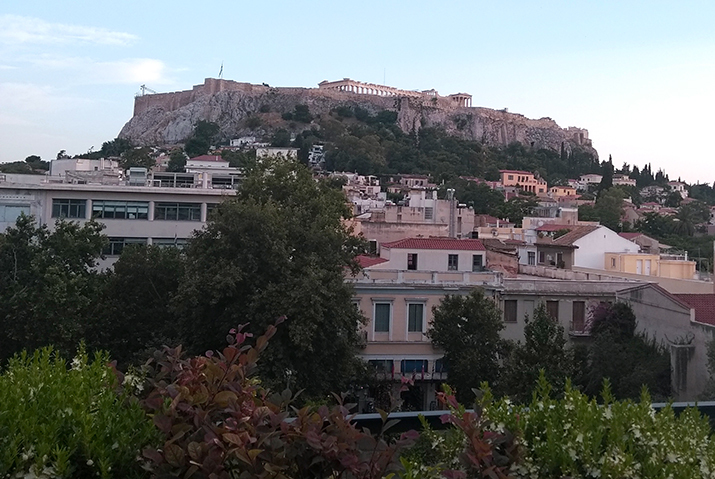 Now I went for a walk in the city centre and they are everywhere, especially near Monastiraki square where they have a great view to the Acropolis hill and the Parthenon. I will list some of my favourites here, but there are a lot more to explore and I will write a dedicated article at some point. A for Athens. Based on the top of the homonymous hotel, this is probably one of the oldest and highest in the area of Monastiraki square. Therefore, it has one of the best views from one of its 2 levels of roof gardens. From the very top and depending on where you sit, apart from the Parthenon you can also see a lot of Athens and up to the sea and Pireaus. It is very romantic especially in the sunset and night, so go there for a romantic date! You might not want to go up top when it’s very sunny, because you might get baked. But you can sit on the floor below even during the day. Kafeneio ‘Oraia Ellas’ / Καφενείον “Η Ωραία Ελλάς”. A more traditional place for coffee and food, located in one of the most touristic streets of Athens. I didn’t know it has a roof garden and I would never have thought of going there, if it wasn’t for my friend Foteini. You will have to cross several streets packed with people to get there, but it is worth it. It has many levels with tables and it also has a terrace with view to the Parthenon. It is not literally on the rooftop though, it is more like a big balcony, so it is also lower than A for Athens. Since this is a more traditional place, you could try having a traditional Greek drink, like tsipouro or ouzo. Loukoumi bar. This cafe/bar also has a rooftop bar. It is much lower than the previous one, but you can still enjoy a nice view of the Acropolis and maybe a bit more quiet during the day. They have recently opened another space across the original building where they host events, workshops, seminars and exhibitions. So make sure to check their website, to learn about the latest happenings. These are my suggestions of roof top bars for now, since I’m going to write a dedicated post soon. Lukumades in Aiolou street, where you can also find the ones filled with various fillings like chocolate praline, lemon cream and banana cream. What? Banana? I have to try that! The seats are not very comfortable, because they are made of marble, but being in that environment is thrilling and it is totally worth it. Some people bring their own cushions, but you can totally sit without them. I’ve been there to watch the opera Madama Butterfly and it was amazing. You can see the events calendar in the Athens and Epidaurus Festival website. Make sure you have a valid ticket to an event, otherwise you can’t get in. You can also visit the site during the day with the same ticket as for the Acropolis. Do you have any more suggestions I should include? Let me know in the comments or by e-mail. P.S. None of my suggestions are sponsored. >> If you found this interesting, please subscribe to my mailing list to receive updates about new articles.